When deciding on specifications, there are lots of questions that tend to pop up, so we've compiled this handy list of FAQ's so you can get answers, fast. How does SuperFOIL compare to other foil insulation? SuperFOIL is tested and certified? SuperFOIL has been tested to BS EN ISO 12667, ISO 8301 by BBA, ( British Board of Agreement) a UKAS certified and internationally accredited laboratory. 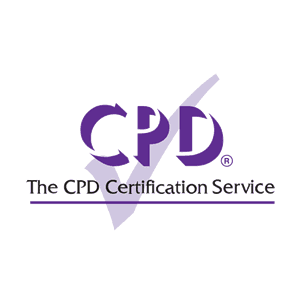 SuperFOIL can be used in many different ways to meet the requirements of Building Regulations for your particular project , we can provide accredited 3rd party U value calculations by SAP qualified professionals. BR443 & Part ‘L’ of Building Regulations for foil Insulation requires tests using a conventional test method. BR443 gives guidance re the performance of materials and calculations of U values. Conduction and convection affect energy loss, and insulation has been developed to reduce losses from conduction and convention. The third factor affecting energy loss is radiated energy. Energy from the sun is radiated energy. SuperFOIL is an effective radiant barrier reducing solar gain in summer and improving insulation in winter. Air tightness and other naturally occurring phenomena effecting insulation performance, such as drafts and dust. SuperFOIL provides an airtight barrier that other insulations may not and as such contributes to a higher overall performance. 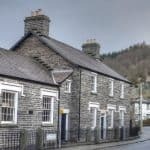 What is the minimum insulation standard I need to achieve? Your building control officer will advise what U-value you need to achieve. As an example, to achieve the current UK building regulations for a retrofit with a ‘room in a roof’, you will normally require a U-value of 0.18. Other constructions may require a lower U-value, for example flat roof and insulation at ceiling level usually require a lower U-value of 0.16. The quantity of insulation required is dependent on the U-value to be achieved and the type of construction. To reach an U-value of 0.18 you will require insulation to an ‘R’ value of 5.5. Note: ‘R’ value is the measure of thermal resistance in a given material. The higher the ‘R’ value the better. ‘U’ value is the measure of thermal conductance on an entire structure (eg Roof). The lower the U-value the better. Can SuperFOIL be used with other insulation products? SuperFoil products are compatible with all other forms of insulation to improve your existing insulation, or as part of new build insulation composite. 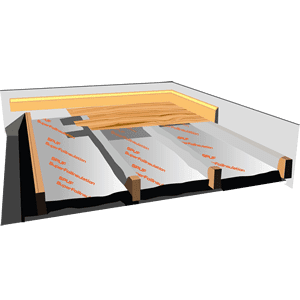 What is radiant heat transfer and why does it matter? Radiant heat is energy like that from the sun. It has no temperature as it travels through space, however when this energy strikes an object, it is absorbed and increases the temperature of that object. The object emits this energy causing heat loss or heat gain. Up to 75% of the heat transfer in your building envelope is in radiant heat energy. Reducing heat gain and heat loss due to radiant heat using reflective insulation can dramatically increase your comfort and reduce your energy cost. Do other forms of insulation prevent radiant heat transfer? Mineral glass, chemical rigid foam and polystyrene all slow down various forms of heat transfer, but they have very low reflective ratings yet very high emissivity ratings. No other form of insulation prevents radiant heat transfer as well as multifoil. This is the reason multifoil’s were invented for the space missions. 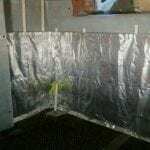 Why install SuperFOIL insulation with an air space? An air space allows heat to be converted into radiant energy. Installing reflective insulation adjacent to an air space allows this radiant energy to be reflected away from the building envelope useful in summer and in the hot sunny days, or kept indoors, useful in the winter and at night. 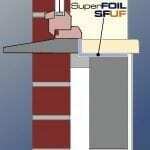 Where can I install SuperFOIL insulation? SuperFOIL products can be installed over or under rafters, in walls and under floors its properties are always at work regardless of position. What’s the difference between radiant barriers and reflective insulation? All SuperFOIL insulation provides a high performance radiant barrier. Radiant barriers combined with air spaces improve the insulation performance of air spaces. Multi layer foil radiant barriers combined with loft material and thermo foam separation layers generate the highest possible performance insulation and are usually classed as multi layer foil reflective insulation such as SF19 & SF40. Humidity has little affect on the performance of multi layer foils. The performance of bulk insulation like glass fibre reduces by up to 35% in humid conditions. The average moisture content in homes typically exceeds 1.5%. SF19 and SF40 are particularly suited to perform in all variations caused by weather. Can reflective insulation be added to my existing insulation? Yes it can, SuperFOIL can be used in conjunction with all forms of insulation to create a highly energy efficient insulation combination. Called ‘Super Insulated’ when combined together to achieve a high performance insulating layer of all 3, convection, conduction and radiation, can substantially help reduce energy costs. Do Multifoils affect reception of TV/Mobile Phones? Television and Mobile phone signals vary from location to location and could in some instances be affected by use of a reflective foil insulation. If you experience a weak signal and you are planning to install SuperFOIL we would advise that your antenna is positioned outside of the insulation envelope. 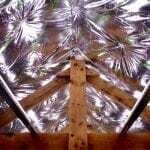 Can I install SuperFOIL above rafters? Yes you can! All SuperFOIL products can be installed over rafters or under rafters depending on your specific construction. In fact, SuperFOIL SF19BB and SF40BB are fully breathable, insulation and breather membranes in one. This reduces installation steps and eliminates the need for a separate breather membrane. Can SuperFOIL be used in a flat roof system? Yes, SuperFOIL can be used in flat roofs and well as pitched roofs. 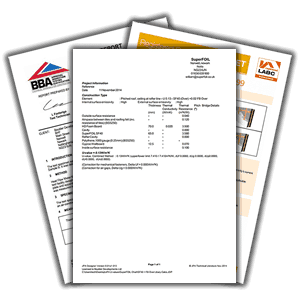 We can help advise you on different build-ups to suit your roof and provide you with approved u-value calculations and condensation risk analysis. 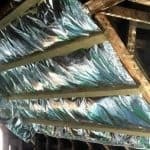 Do I need to ventilate my rafters when using SuperFOIL? 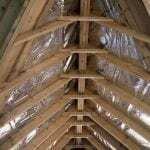 Venting a rafter void is typically not required if you have a breathable membrane (or SuperFOIL SF19BB or SF40BB) installed above the rafters. However, if your rafters have a non-breathable felt (often found in older roofs) you very likely need to leave a 50mm ventilated gap below the felt to allow excess moisture to escape. 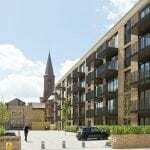 You should always check with your building control authority to confirm your proposed plans. 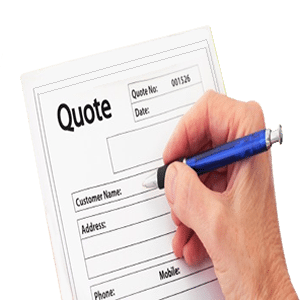 They will advise you on the safest design details for your roof. Can I cut SuperFOIL into strips and install between my rafters? This is not a recommended install method for SuperFOIL. It would severely reduce the performance of the product. SuperFOIL is designed to be installed as a continuous layer on the face of the timbers. What size battens do I need to use with SuperFOIL? Can SuperFOIL be installed on a solid or cavity wall? SuperFOIL can be install in any wall type. Installing onto a solid wall typically consists of fixing battens onto the existing wall, then stapling the SuperFOIL to the battens, followed by fixing counter battens to the SuperFOIL before installing your interior finish such as plasterboard. Will SuperFOIL reduce the noise from neighbours? Yes, SuperFOIL has sound insulation benefits as well as thermal. The improved air tightness will assist in reducing airborne noise and the bulk of the insulation will help reduce incoming high frequency sounds. We are looking into specific testing for sound insulation properties. Can SuperFOIL be used for external wall insulation (EWI)? Yes, SuperFOIL can be used externally. Typically we recommend our breathable products such as SF19BB & SF40BB which will provide both insulation and breathable membrane in one layer, helping to reduce the overall build up. Can SuperFOIL be used externally on walls over 18m? Yes, we offer a product called SFNC which is a fully non-combustible insulation suitable for external cladding systems on building over 18m. SFNC has been used on multiple large products most recently on Royal Papworth Hospital. 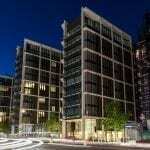 Can SuperFOIL achieve building reg requirements by itself? Yes, SF19+, SF40 & SF60 all achieve or exceed typical retrofit requirements on a wall of 0.28U with no other insulation required. SF60 can even achieve new build building regs of 0.18U in a wall value with no other insulation required, SF60 is the only multifoil insulation on the market able to achieve this high standard by itself. If I install SuperFOIL SF40 on the internal side of my wall, do I need to install a VCL behind the plasterboard? 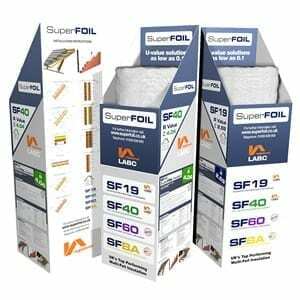 No a separate VCL is not required, the outer layers of SuperFOIL SF19, SF40, SF60 are a high performance vapour barrier with a vapour resistance of 1200 MNs/g. 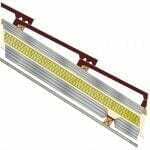 When installed to the manufacturers recommendations, will vastly outperform most standard VCL materials. 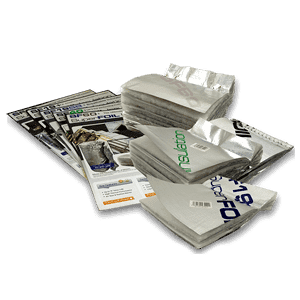 Can SuperFOIL be used under a liquid screed? Yes, SuperFOIL SFUF can be used under screed. The top layer of SFUF is polythene which protects the insulation from the screed. Do i need edge insulation when using SFUF? SFUF should be lapped up your wall slightly to help tank the floor, this will also help provide some expansion room. 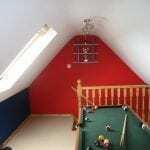 For small rooms this may be adequate, for large rooms we would advise use of both SFUF & edge insulation. Yes, SFUF can be used directly under carpet or underlay. As SFUF is not a solid product though and carpets / underlay's vary in type quite considerably we recommend trying a test area to make s re you are happy with how it feels underfoot before doing the full work. Can i add multiple layers of SFUF to the floor? Yes, SFUF can be used in multiple layers though we tend to suggest keeping it to 1 or 2 layers. If using multiple layers the best method is to create an insulation "sandwich" by layering SFUF with traditional insulation such as PIR. Can i use SuperFOIL in a floor with underfloor heating? Yes, SuperFOIL can be used in conjunction with underfloor heating. In fact SFUF was designed specifically for this purpose.